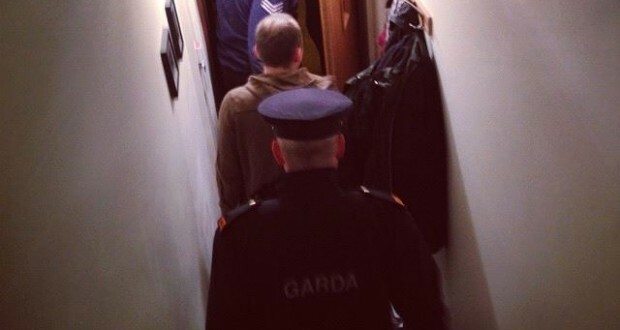 The arrest of 21 anti water charges campaigners in Dublin, the threat to arrest a further 17-21, the threat to send a file to the DPP and the possibility of court action on serious charges – all are sure signs of the Gardai playing an overtly political role. The Gardai have simultaneously targeted the community of Jobstown, the anti water charges movement and the Anti Austerity Alliance. Their actions are a blatant attempt to discredit the anti water charges movement by trying to associate it in the public mind with criminality. The fact that three of the first four people arrested were an Anti Austerity Alliance TD and two Anti Austerity Alliance councillors shows that political policing is at the very core of these actions. Did Government Ministers put pressure on the Gardai to take these actions? Did Government Ministers give the green light for these actions? It is entirely possible that they did. But, even if they did not, the Garda action is still political in its essence. The Garda Commissioner is appointed by the Government and both Government and Gardai defend the same capitalist establishment shaken by the power and the scope of the anti water charges movement. 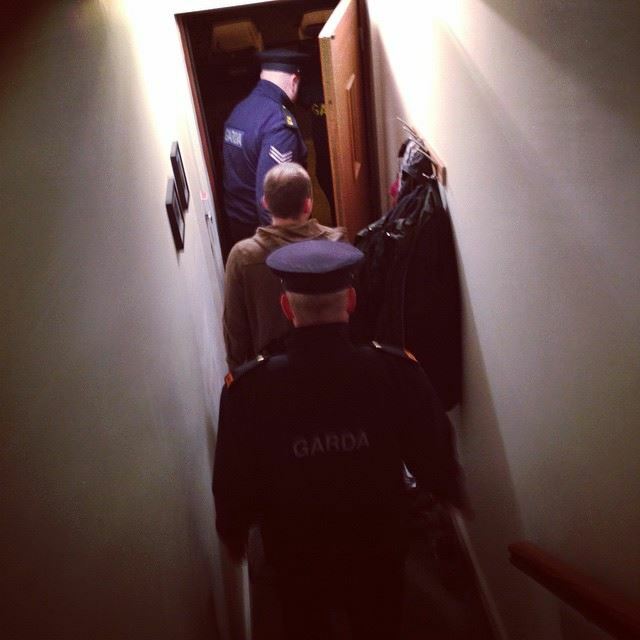 The role of the Gardai as enforcers for Irish Water, water metering and the hated wated charges has torn the veil of Garda “neutrality” and “impartiality” from the eyes of many in recent months. We demand that this political policing is brought to an end. The Gardai should have no role to play in policing community campaigns and struggles by working class people. Democratic community control over the Gardai is needed as an alternative to the Gardai being run as a centralised force led by a Government-appointed Commissioner. This political attack will be fought right down the line until the case is dropped or the charges defeated. Of course, the attack will be fought using legal weaponry – the weak case of the establishment will be subjected to the strongest legal scrutiny and exposure. But first and foremost, a political attack must be fought politically. A good first step has been the exposing of the hypocrisy of these charges by the Anti Austerity Alliance and other Left TDs and the protests that have been organised against political policing. The questions asked by the TDs have weakened the Garda case – Why is a working class community being penalised for actions similar to those taken in the past without penalty by students from different socio-economic backgrounds? Why are such huge Garda resources being put into this case when real crime affecting communities goes unpunished due to scant Garda resources? 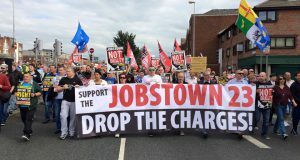 The protest planned for Tallaght this Saturday, the protest held at the Department of Justice last night and the simultaneous protests across the country have been important too. “Feet on the street” has been a key strength of the anti-water charges movement and will be on this issue too. The arrests have served not to weaken the anti water charges movement but the opposite. Outraged by these actions, the movement will grow stronger in its resolve. The fight against political policing must now be linked to a renewed push from the anti water charges movement. The bills are due to start arriving in April, not much more than six weeks from now. Barely half the country registered with Irish Water for their second deadline of Feb 2. Those figures spelled bad news indeed for Irish Water and the Government. Mass non-payment has the potential to sink Irish Water and defeat the Government on the issue. If a majority do not pay, if close to a majority do not pay, Irish Water is backed into a corner financially and the Government is backed into a corner politically. They cannot cut your water off, they cannot deduct it from your income, there are no penalties until the summer of 2016 – after the General Election. Frightened by the mass protests the Government have left themselves with no heavy penalties with which to threaten non-payers. Mass non-payment offers a huge possibility to deal a decisive blow. 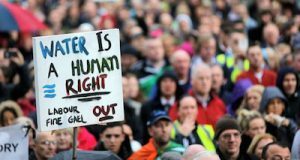 The anti water charges movement now should resolve to make 2015 the year of mass non-payment in the same way that 2014 was the year of the mass demonstrations. The demonstrations forced the Government to retreat on the size of the charge. Mass non-payment can force the abolition of the charge altogether. Opposition to political policing should be embedded in the policies of the movement about to battle the Government on the bills issue. Last but not least, if the capitalist establishment are targeting the AAA part of the way to defeat this attack is to build the AAA itself. An AAA with more seats in the next Dail than the Labour Party would be an incredible response to Joan Burton and her cronies. An AAA with thousands of new members campaigning against water charges, austerity, this Government and the unjust capitalist society it defends would be a strong response too. Join us today!